Another impressively large pure silver coin struck by the Perth Mint. 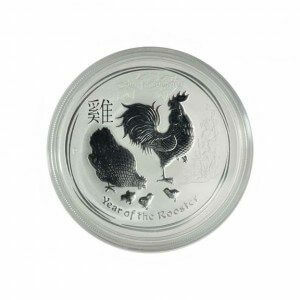 This beautifully made 2017 Australian Silver Rooster Kilo coin falls into the category of what we call “limited edition bullion products” and portrays the ninth animal in the 12 year cycle of the Chinese lunar calendar. The front of the coin features the familiar Queen Elizabeth II and inscriptions include the coin’s legal tender value (30 DOLLARS) the date (2016) and 1KG 999 SILVER. Under the queens picture is the artists initials IRB (Ian Rank Broadley). The legal tender value is largely symbolic but adds a plus to the coin and singles it out as being produced by a sovereign nation. The reverse of the Australian Silver Rooster Kilo features a mother hen and her babies along with a rooster. The weight of the Australian Silver Rooster Kilo in pure silver is 32.15 oz (1 kilo) and its diameter is substantial (3.93 inches). The Perth Mint also provides a heavy acrylic container which protects the coin nicely. Visit GoldDealerCA on You Tube to see our informative videos on precious metals.